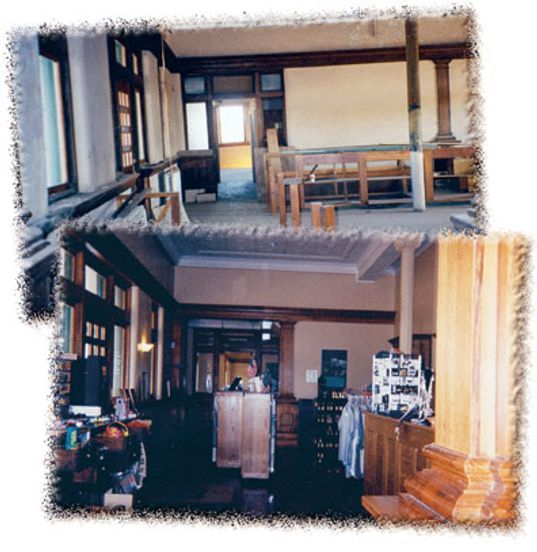 The transformation of Sedalia’s Historic depot from an elegant waiting station to a place where the community can once again exchange knowledge and information and renew old memories of days gone by, has been an exhilarating experience. After being abandoned by the Missouri-Kansas-Texas Railroad in 1983, the Missouri Department of Natural Resources received title to the depot as part of the 200 mile Katy Trail State Park. Wulff Rodgers Construction, Columbia, Missouri, received the state’s contract for both the exterior and interior renovation. 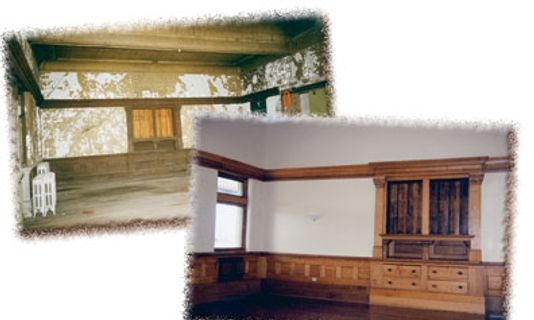 Funding for the renovation was provided by federal and state funds with local participation. S.B.W.E., Sedalia were the architects. 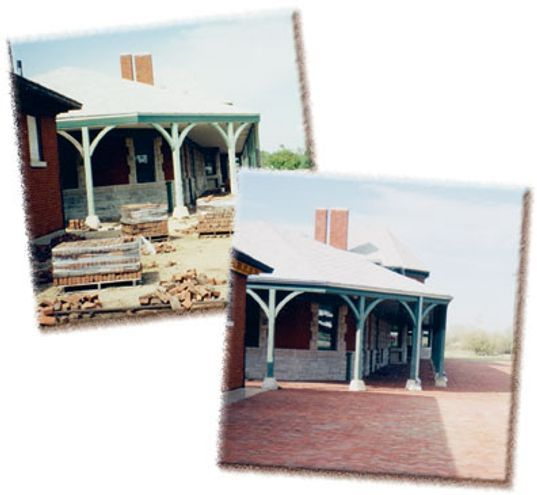 Exterior renovation began in 1998 and included replacement of the roof, gutters and windows; cleaning of the brick; repair to the grade of the brick pavers and development of the Federal Express Building into a rest room facility for trail users. 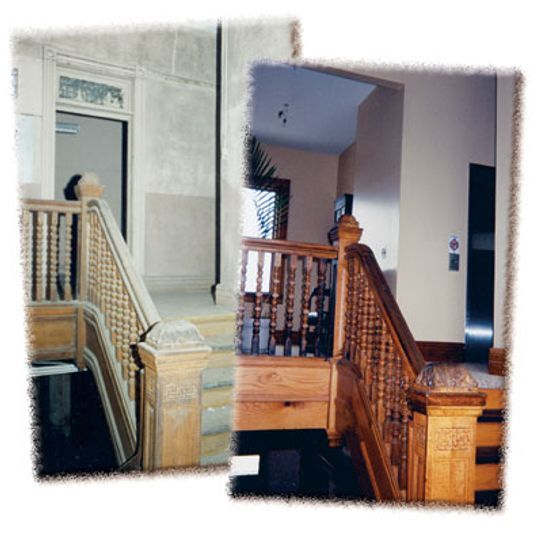 Interior renovation began in 1999 and was completed in 2001. This process included gutting the building to the slat board; replacing and upgrading electric and plumbing; installation of insulation and sheet rock; replacement of the tin ceiling; cleaning and refinishing of the wood trim and floor installation of an elevator, installation of a security system and sprinkler system; installation of a ground source heat pump system and enhancements to the storm sewer drainage system. The original tin ceiling had a different pattern in each room, however due to the lead based paint issue and the extent of deterioration, it could not be salvaged. The wood floors in the women’s and men’s waiting room are original. The remaining wood floors are new. Approximately 90% of the wood work is original. 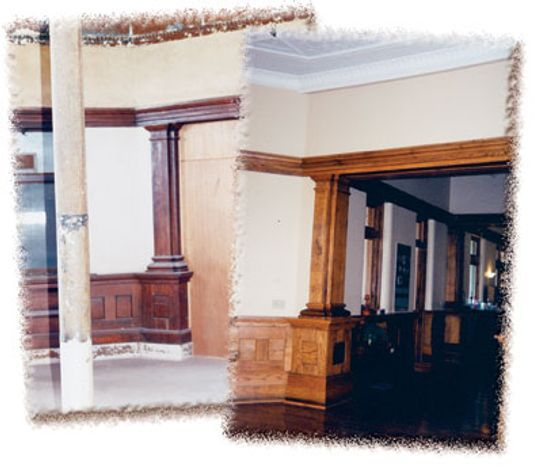 Due to the difference in thickness from the original plaster walls to the sheet rock walls, it was necessary to rework much of the wood work. (Some of the columns have as many as 65 pieces of wood). 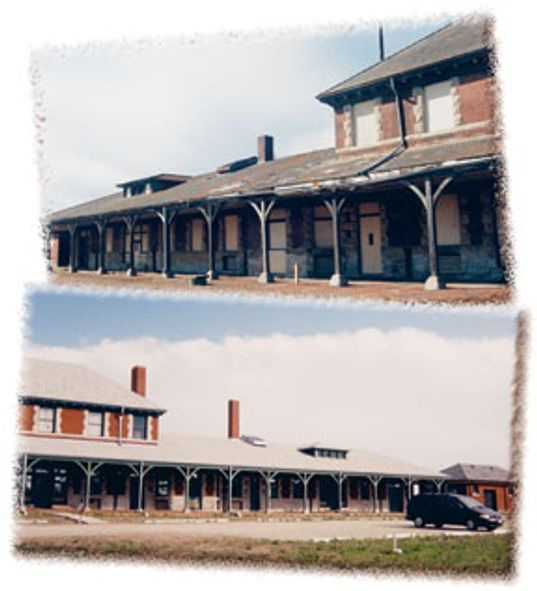 In May, 1996, the Missouri Department of Natural Resources accepted a proposal submitted by the Sedalia Area Chamber of Commerce/ Convention & Visitors Bureau to serve as managing tenant of the Sedalia Katy Depot which is a part of the state park system. With the support of the Sedalia Area Tourism Commission (a countywide commission responsible for collecting and allocating lodgings tax revenues), the Chamber began research on how best to accomplish these objectives. This research, conducted by Chamber staff resulted in a conceptual design plan which projected the development of a railroad heritage museum. The potential of a railroad heritage museum was first identified in Sedalia’s Tourism Development Conceptual Plan adopted in 1994. A 12-member task force developed the plan over a one year period under the direction of a Tourism Development Consultant. Growth areas identified in the plan include the need for development of additional year-round attractions. Such year-around attractions would bring more visitors to Sedalia and extend the stay of others. The feasibility of a railroad heritage museum connects with the rich railroad history of Sedalia. The acceptance of the Chamber’s proposal by DNR opened the door to pursue adding a year-round railroad heritage museum in the Sedalia Katy Depot. Contacts were made with the various historical societies to determine their interest in operating such a museum. Due to their volunteer nature, limited resources and geographic diversity of the membership, they were unable to undertake development and operation of a museum. A conclusion was reached that if a railroad heritage museum was to happen, it would be the Chamber’s leadership that would make it a reality. The historical societies were extremely supportive in the idea and have provided invaluable assistance in the development process. Therefore, research on museum management, railroad heritage and local history was begun. The first step was to connect with various railroad historical societies, museum associations and historic preservation agencies. These connections include the Katy Railroad Historical Society, Missouri Pacific Railroad Historical Society, Union Pacific Railroad Historical Society, National Railway Historical Society, Railway & Locomotive Historical Society, Railroad Station Historical Society, Association of State & Local History and Missouri Museum Association. The next step was to acquire a railroad research library which now contains over 75 publications covering railroad heritage, museum management, local history and historic preservation. Tours of railroad museums include: The Colorado State Railroad Museum in Golden, California State Railroad Museum in Sacramento, Texas State Railroad Museum in San Antonio, Galveston Texas Railroad Museum, Savannah Georgia Railroad Museum, Grandview Missouri Railroad Museum, Frisco Railroad Museum in Springfield, Missouri, Red River Railroad Museum in Denison, Texas, Museum of Transportation in St. Louis, Missouri, Seashore Trolley Museum in Portland, Maine, Steamtown in Scranton, Pennsylvania, Railroaders Memorial in Altoona, Pennsylvania, Pennsylvania Railroad Museum in Strasburg, the B & O Railroad Museum in Baltimore, Maryland, the Western Heritage Museum in Omaha, Nebraska, the Georgia Railroad Museum in Savannah, Georgia, and the North Carolina Transportation Museum in Spencer, North Carolina. The research provided the reference needed to develop a Museums Operation Plan and a Museum Conceptual Design Plan, which were completed in November, 1998. In February, 1999, the Missouri Humanities Council and the Missouri Arts Council hosted a Small Museum Design Charette to review the Conceptual Design Plan. Among their recommendations was a suggestion to expand the scope interpretation to include other significant heritage stories represented in the area. Their recommendations were included in the master planning process which was completed in December, 1999. A master plan charette process was conducted in August, 2000, with recommendations being incorporated into the exhibit design planning process. The exhibit design process was coordinated under contract with Thompson Museum Consulting of St. Paul, Minnesota. The exhibit design plan respects the integrity of the historic site and prioritizes interpretation to the telling stories of how the railroad influenced the development and growth of the Sedalia area. Funding for development of the exhibits and landscaping were provided by the Housing and Urban Development Economic Development Initiative Grant enabled by U. S. Senator Christopher “Kit” Bond, the Missouri Department of Transportation Enhancement Grant enabled by State Senator James Mathewson, various private foundations including the Union Pacific Railroad Foundation, the Sunderland Foundation and local contributions.